Looking for an affordable shelf that also doubles for storage? This simple DIY will hold your family pictures AND your magazines for only about $15 at the most! First read what the wood stain says and if it has any special directions, be sure to follow them. If not, just follow these instructions. If the wood isn't already smooth, you may need to sand it starting with a 120 grit and working your way to a 220 grit. 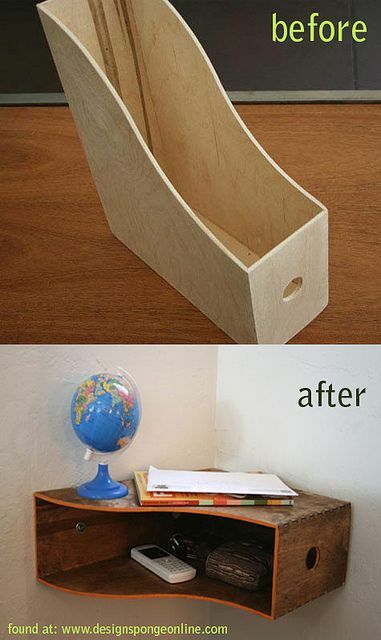 Next you will open your wood stain and start applying it to the magazine holder. The longer you let it sit, the darker the wood will stain so I suggest that you wipe it with a clean rag following the grain as soon as possible MAKE SURE NOT TO LET THE STAIN DRY! . Once the magazine holder is dry, simply attach it to the wall and enjoy!